0:00 You can import and export the text for your script using the menu shown here. 0:04 Text files imported and exported from the app are plain .txt files formated as shown here where each script section's text is separated by a blank line. 0:16 When you are starting with an empty script like this you can import any text file you want to start your script. 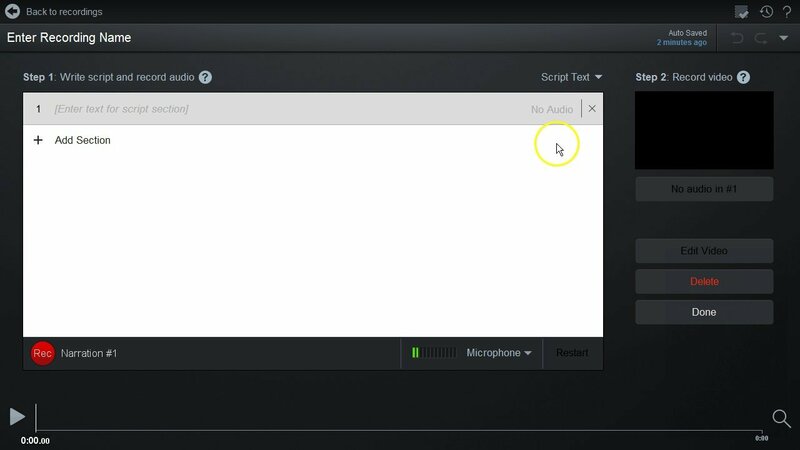 0:25 But if your script has some audio or video already recorded then you can only import a text file with exactly the same number of text sections as your current script which will replace any current text you have in the script. 0:37 You can undo a text import using the undo button if you'd like to go back before the import. 0:43 You also have the option of exporting the script text as a caption file which is a special text file with timestamps to denote when to show the text captions from your script. This is useful if you're going to upload your video to YouTube or another service that allows you to also import text captions. 1:01 The caption file export will only work if you actually have some audio or video recorded for your script and any script sections which have text but no audio or video will not be output when using the caption file export.